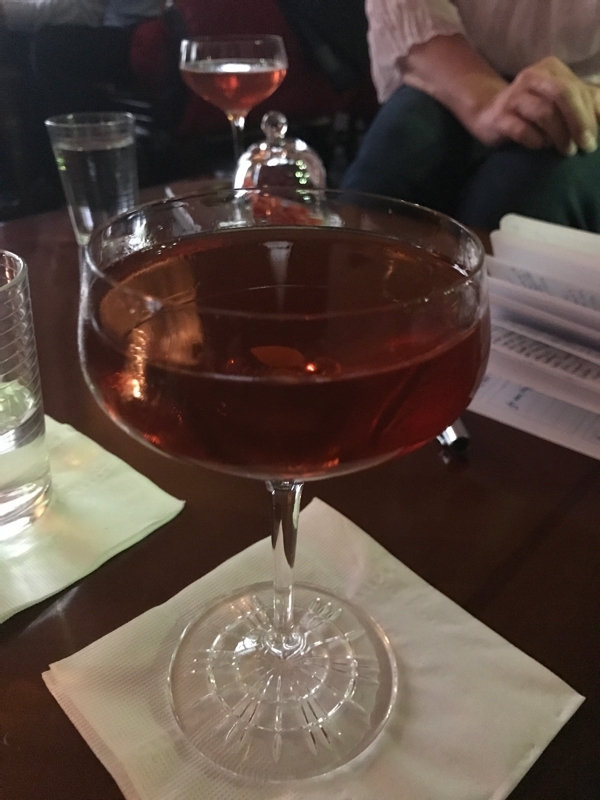 You will recall that at AnonymouS Bar in Prague I asked the bartender to make me a drink that would delight me, based on my recipe for a Smoky Topaz. 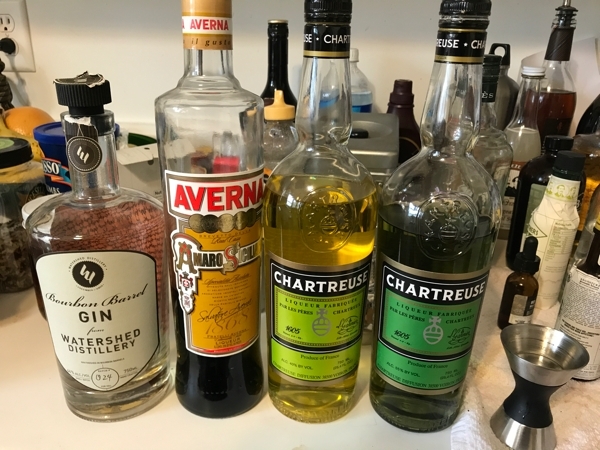 Barrel-aged gin, Averna Amaro, yellow Chartreuse, and green Chartreuse—and AnonymouS had only the green Chartreuse. …except… which amaro? There are scores of these herbal liqueurs, as cataloged in Brad Thomas Parsons’ Amaro. Here are the actual amaros that I currently have. I eliminated the Nonino without even trying it: it’s too light, and the drink was rather dark. I also eliminated the Angostura, because that flavor profile didn’t match the drink. 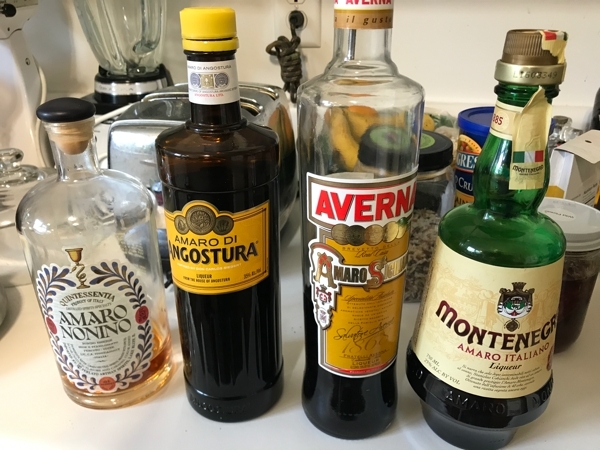 Next, even though I knew the missing amaro was not Averna, it was all I had left so I tried it. It was of course not correct. 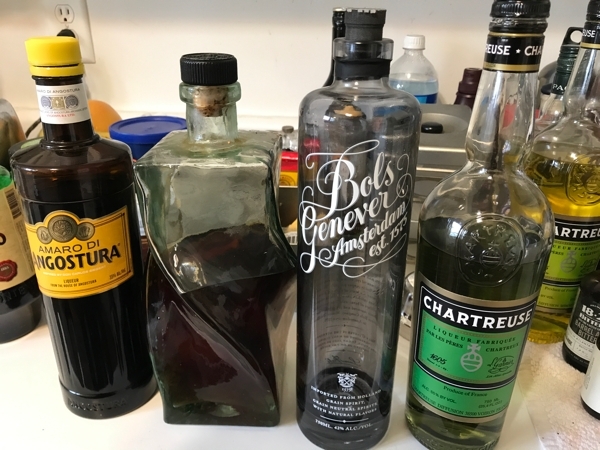 All this time I was futzing with the proportions, figuring the genever was at 1.5 oz and the other ingredients were probably in a 3:2:1 kind of stack. I looked in Amaro to see what my other options might be. There were two likely suspects: Becherovka and R. Jelínek Amaro Liqueur, both from the Czech Republic. I figured it couldn’t be Becherovka because that’s kind of the Czech national liqueur and the bartender would have named it. I figured I was doomed to begin my search for the R. Jelínek. So I emailed AnonymouS and got a reply rather quickly. Did I know the bartender’s name? (I had called him a waiter, but all the waiters at AnonymouS are bartenders.) Or could I describe him? Naturally I did not know his name, and as for description: “young, slender, dark-haired” was not very helpful. But perhaps he would remember the quartet of older Americans who rather enjoyed themselves that evening? Indeed Jaroslav Modlik did remember us, and he remembered the drink. And since it was not one of their signature cocktails—”I make just especially for you,” he said—he was happy to share the recipe with me. The amaro was the Angostura. I felt like an idiot: that was the basic woody flavor (along with the chartreuse). 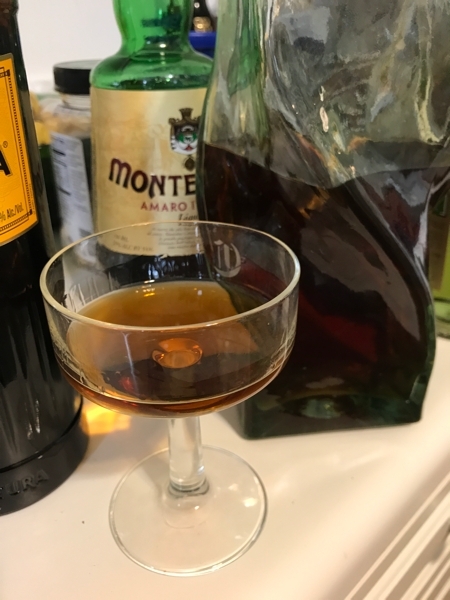 It is Jaroslav’s privilege to name this drink, but for the moment it’s going into my cocktail book as the Smoky Quartz (with full credit and back story of course). Stir with ice, serve with orange peel. This was the drink from Prague, and it is every bit as luscious here at home as abroad. 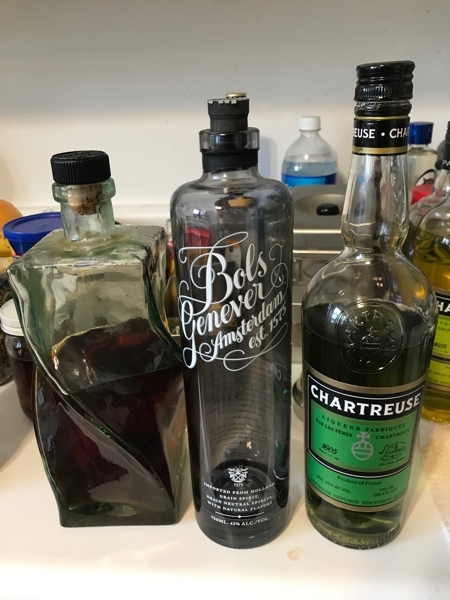 I find that I need another bottle of Bols Genever, which frankly I didn’t think I would ever need to replenish. It is a point of extreme pride for me that Jaroslav Modlik is head bartender at AnonymouS, and he invented a cocktail for me. Is that cool or what? Damn you. I have to buy two bottles to try it. Or just come to fireside tomorrow night.